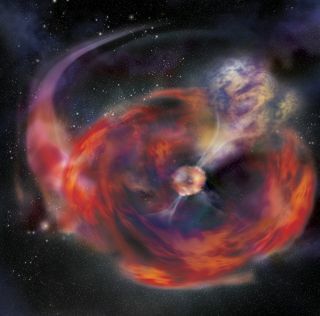 Artist's impression of the tidal disruption of a minor body by a neutron star. "It is important to understand gamma-ray bursts to get some global picture of the life and death of massive stars," said astronomer Christina Thöne of the Institute of Astrophysics in Andalusia, Spain. "Massive stars are ultimately the ones that decide what elements are present, created and recycled in the gas in our and any other galaxy." Now scientists have two competing explanations for the Christmas burst: a cosmic impact on a dead star in our galaxy, or a peculiar supernova in a distant galaxy. The Christmas burst as it might have been painted by Vincent van Gogh.